October | 2014 | Alveston & Tiddington Allotments & Gardens Assoc. 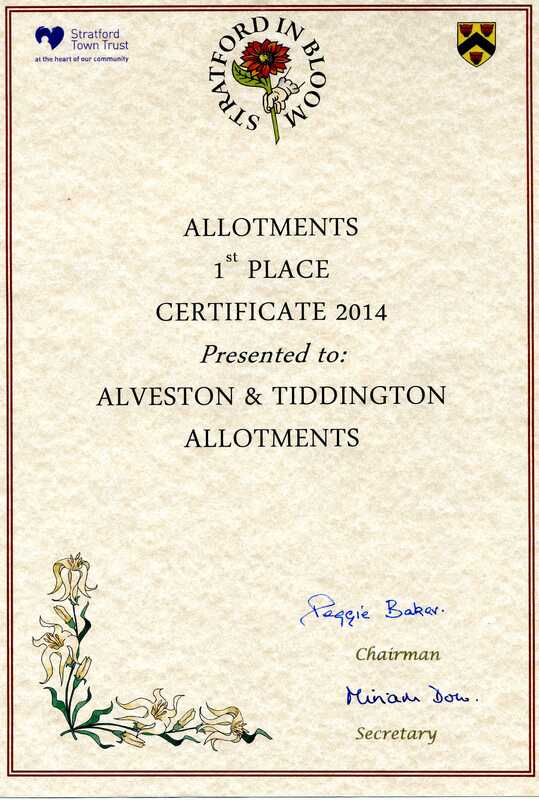 Alveston & Tiddington Allotments & Gardens Assoc. Stratford in Bloom 2014 winners! We were very pleased to be awarded this by Stratford in Bloom and reflects well on all the hard work plot holders have made over the last year to keep the site as well maintained as possible. A good showing of flowers around the site probably helped – as well as encouraging the all important pollinators to hang around our veggies at the same time! As well as the certificate we’ve been given a £50 voucher for a local nursery, so we’ll need to decide at the AGM what to spend it on. Just a quick reminder to ATAGA members that we have our AGM on Sunday 26th October starting at 11am until 1pm in the Malt House main hall in Alveston. All current members are welcome to attend to have their input into how our association is run!